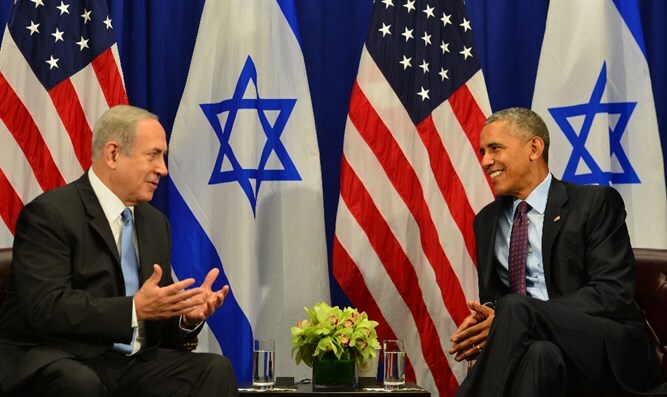 Netanyahu, Obama, meet in New York. Obama expresses concerns about 'settlement' building and lack of implementation of the 2-state solution. Prime Minister Binyamin Netanyahu is currently meeting with President of the United States Barack Obama in New York. Each opened with some brief remarks before the meeting. Netanyahu started by expressing his appreciation for the friendship between the two nations. "I want to thank you for the extensive security and intelligence cooperation between our two countries. I don't think people at large understand the breadth and depth of the cooperation, but I know and I want to thank you on behalf of all of the people of Israel," Netanyahu said. He thanked the president for the "many meetings they've had....The greatest opportunity is to advance the goal of peace. That's a goal that I and the people of Israel will never give up on." "Israel has no greater friend than the United States of America and America has no greater friend than Israel," Netanyahu said. "Our alliance has grown decade after decade, through successive presidents, bipartisan Congress and with the overwhelming support of the American people. It is an unbreakable bond." Prime Minister Netanyahu also made sure to compliment Obama on "what I hear is a terrific golf game." "I want you to know Barack that you will always be a welcome guest in Israel." He then invited Obama to play at a golf course near his home in Israel. "We'll set up a tee time," Obama quipped. Obama began by saying that he was personally thinking about and praying for the health of Shimon Peres, who he described a "great friend, a hero and a giant in the history of Israel." "As PM Netanyahu mentioned, the bond between the United States and Israel is unbreakable. It is based on common values, family ties, a recognition that the Jewish state of Israel is one of our most important allies," Obama said. "It is important for America's national security to ensure we have a safe and secure Israel, one that can defend itself." Regarding the new military aid deal recently signed, the President said: "It allows the Israelis to have some kind of certainty in a moment when there's enormous uncertainty in the region. It's a very difficult and dangerous time in the middle east." President Obama then moved on to outline the topics to be discussed in the private meeting between the leaders. "This will give us an opportunity to talk about the challenges that arise around situations like Syria, I'll also be interested in hearing from the Prime Minister his assessment of conditions within Israel, and in the West Bank, and obviously our hearts go out to those who have been injured, both Israeli and Palestinian." Obama made sure to mention the topic of "settlements," and to express his hope that Israel and the Palestinians will move in the direction of a 2-state solution even after the end of his tenure as President in 3 months. "We do have concerns around settlement activity as well, and our hope is that we can continue to be an effective partner with Israel. "Obviously, I'm only going to be president for another 3 months. "Our hope will be that in these conversations we get a sense of how Israel sees the next few years, what the opportunities are and what the challenges are, in order to assure that we keep alive the possibility of a stable, secure Israel, peace with its neighbors and a Palestinian [nation] that meets the aspirations of their people." After the meeting concluded, several senior administration officials offered a brief readout of the conversation. The two leaders discussed with concern the recent spike in violence between Israelis and Palestinians and Obama's concern over the continuing Israeli "settlement" activity. "There was also a discussion about Israeli-Palestinian relations and some of the challenges posed in particular by the violence that is ongoing, the recent spike in violence...The continuance of the settlement activity as it enters the 15th year of occupation..."
A senior administration official said that in terms of "settlements," Obama raised "profound U.S. concerns about the corrosive effect that that is having on the prospects of two states," which PM Netanyahu pushed back on. "They've never papered over their differences," another senior administration official said.